Vedantu.com - No.1 online tutoring company in India provides you Free PDF download of NCERT Solutions for Class 6 Maths Chapter 4 - Basic Geometrical Ideas solved by Expert Teachers as per NCERT (CBSE) Book guidelines. 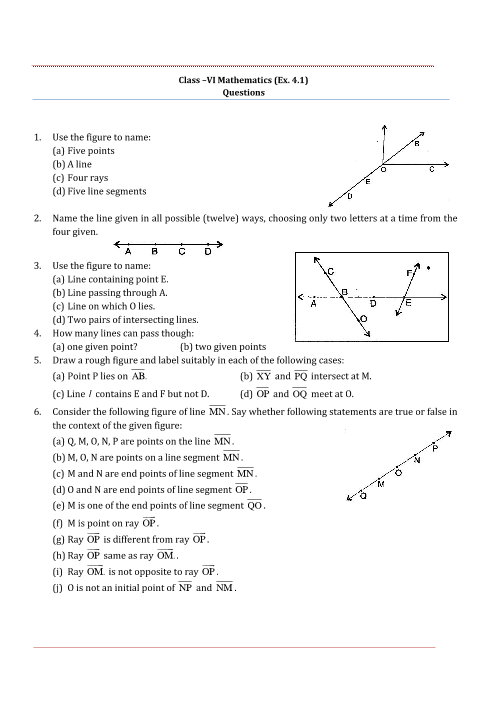 All Basic Geometrical Ideas Exercise Questions with Solutions to help you to revise complete Syllabus and Score More marks. Register for our free webinar class with best mathematics tutor in India. Students observe and use different objects like boxes, tables, books, the tiffin box they carry to their school for lunch, the ball with which they play and so on. All such objects have different shapes. The ruler which they use, the pencil with which they write are straight. The pictures of a bangle, the one rupee coin or a ball appear round. In NCERT Grade 6 Chapter 4, Basic Geometrical Ideas, students will learn some interesting facts that will help them to know more about the shapes around. Introduction to Geometry, Points, A Line Segment, A Line, Intersecting Lines, Parallel Lines, Ray, Curves Polygons and Angles are the main topics discussed in this chapter.NCERT Grade 6 Chapter 4, Basic Geometrical Ideas helps the students to learn Geometry with fun through activities. Word problems help to introduce new concepts in an interesting way. This chapter helps to deal with Basic Geometry. Solved and unsolved problems shall help the students to master the topic so that they can deal with complexities of Geometry in the future with confidence and ease. Activities done in groups not only add fun to learning but also aids to better and long-term retention of the concepts. Get 100 percent accurate NCERT Solutions for Class 6 Maths Chapter 4 (Basic Geometrical Ideas) solved by expert Maths teachers. We provide step by step solutions for questions given in class 6 maths text-book as per CBSE Board guidelines from the latest NCERT book for class 6 maths. The topics and sub-topics in Chapter 4 Basic Geometrical Ideas are given below. Other than given exercises, you should also practice all the solved examples given in the book to clear your concepts on Basic Geometrical Ideas. You can also download the free PDF of Chapter 4 Basic Geometrical Ideas and take the print out to keep it handy for your exam preparation.